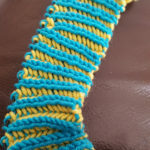 Philosophy of knitting, or just wondering why. I wrote this post a couple of months ago and let it percolate. For the last few years, I’ve been rather enviously reading the accounts of people who have visited Edinburgh for the Yarn Festival. This year, I waited anxiously, my fingers hovering over the keyboard as the classes opened for booking. 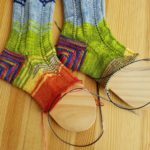 In a frenzy of clicking, I managed to score places on Woolly Wormhead’s Advanced Grafting class and Tom of Holland’s Darning class. After the adrenalin had calmed down, I realised that I had managed to book classes, neither of which involved knitting needles. Still, they were both subjects I was keen to master. One advantage of booking classes is that you get early access to the marketplace. I would later discover quite how much of an advantage this is. I had three nights away on my own – a rare occurrence. After a recommendation from a friend, I booked into a Premier Inn Hub. Tiny room, barely more than a bed, loo and shower, but quite enough when all I needed was somewhere to sleep and store my knitting things. I had originally been planning to go up for the Thursday marketplace, but work commitments meant I couldn’t leave until lunchtime so I got to Edinburgh early evening on Thursday. I hadn’t been able to get tickets for any of the evening stuff, so I headed out to find somewhere to eat, armed with a list of good places to eat from a local who was, sadly, away that weekend. An excellent Mexican meal within 5 minutes walk of my hotel suited me just fine. Eating alone in restaurants is not really something I’m used to, but I was armed with a good book on the kindle and also enjoyed a sneaky bout of people-watching. The next day, I went out bright and early to find a bus. Living out in the sticks as I do, the buses are infrequent and very basic. I was somewhat charmed by the phone app that told me exactly where the next bus was and which bus-stop to head for. Getting on the bus and finding that there’s a screen saying which the next stop is was almost too futuristic. I got over it. The closer we got to the Corn Exchange, the more people sporting scarves and shawls, hats, gloves and sweaters got onto the bus. 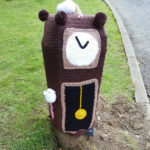 I don’t know what the non-knitters thought, but I did see a few raised eyebrows. It was lovely to find myself among my tribe. My previous experience of large yarn-based events is that there is always a great deal of queuing involved at the beginning of the day. This time was different. After only 5 minutes in the early access queue I was into the marketplace. The selection of vendors was amazing. 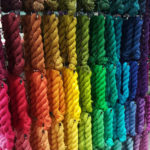 A combination of well-known brands and yarns from lots of different areas. 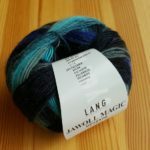 I only had an hour before my first class, so I did a quick recce round to see what was there and did a bit of shopping for someone who had asked for yarn. Advanced grafting was my first class. 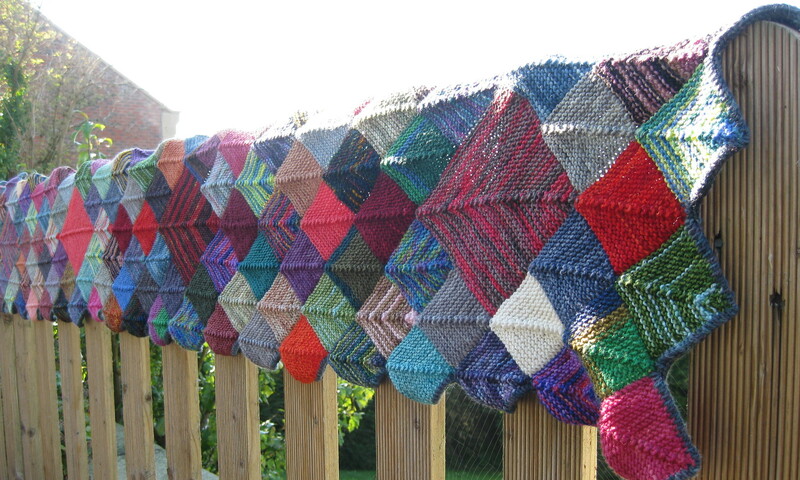 I’ve followed Woolly’s patterns for years and did her hat design class about 6 years ago. A while back, she wrote that she was planning a book on grafting, but she moved in a different direction and decided not to. All this means that I was very pleased to see this as a topic on the class list. Armed with a bag of swatches and some snacks I was ready to go. Inevitably, there were a couple of people who seemed not to have read the pre-requisites for the course, or done any prep. Must have been rather annoying for Woolly, but she was very understanding. We had been warned that the material was quite heavy going. For me, as in many learning situations, the theory side of it was very clear and easy to grasp but implementing the practical proved more of a challenge. 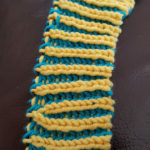 I did manage some passable grafts of some bottom to top ribbing during the class and have done some more since then. Woolly’s teaching was as excellent as expected and the take-home notes were really high quality. One challenge we were left with was finding a way to do a perfect graft on top to top ribbing. This is almost certainly mathematically impossible, but I think I’ve found a work-around for 1×1 ribbing that looks pretty good. More on this in a later post. After three hours, I was pretty exhausted. Coming out of the class, I discovered that the event was now flooded with people and it was much more of a scrum to get to all the stalls. 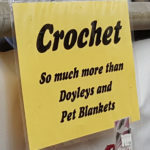 I picked up a couple of things I’d seen earlier and spent a very long time at Ysolda’s bookshop, including a nice sit-down and knit at a handy sofa. While I was installed in the window seat, in the other 5 seats were a constantly revolving selection of nationalities. EYF is a very international festival. After a couple more hours I was peopled out so I headed back to the city and went for a wander round. It was bitterly cold, but it had been about 20 years since I was last in Edinburgh so I was determined to see some of the sights. I wandered up and down the Royal Mile, across to Princes Street and back again, making my Fitbit very pleased if nothing else. The downstairs area at the hotel was periodically occupied by groups of knitters, but my knitting time never seemed to coincide with theirs. On Saturday I had no classes, but I did have an early access ticket so I went over to the festival to take advantage of that before it got too crowded. My aim for the morning was to buy yarn. I didn’t have anything specific in mind and didn’t want to spend too much, but wanted to get something I couldn’t normally find. I ended up with some Jill Draper yarn that matches my new handbag. I can’t give any more details as it has been spirited away ready for my birthday. I got the bus back into town and looked for a non-chain restaurant to eat in. I found a delightful place described as a ‘Scottish Restaurant’. A starter of haggis, neeps and tatties was good, but weird that the food was served in quinelles – doesn’t quite fit the image of down-to-earth Scottish cooking. I spent a couple of hours at the National Museum of Scotland, which was awesome. I suspect we will be returning to Edinburgh with the kiddies before too long. One advantage of travelling without kids is that when I found something boring, I could move on and when I was fascinated by something no-one was nagging me to leave. After the museum I found some second-hand bookshops in Old Town. It was St Patrick’s day, so the number of people out drinking was very high. At one point a rather drunk Irishman burst into the bookshop I was in. “I f-ing love Harry Potter and I need a copy right now”. Marvellous! Fortunately there were plenty of copies to be had so he went away happy. It snowed on and off all day on the Saturday, never laying, but very cold indeed. Sunday morning, I woke to discover that the snow had lain overnight and was about an inch deep. Now I’d accidentally booked a train home a couple of hours earlier than I’d originally intended so my plan for Sunday was quite precise. I also had only one pair of shoes with me (thus leaving more room in my case for yarn) and they weren’t shoes with grips. The day was looking quite interesting. While I was out the previous day, I’d found an episcopal church with an 8am service down the road from the hotel, so I went along. Probably a good thing I did as there were only four of us there ( and two of those were the priest and verger). Somewhat breathless after a service said at breakneck speed, I headed out for the bus, sliding my way along, towing my case and wondering why I had bought such heavy books. My class was at one of the other venues: The Water of Leith Centre. Tom of Holland was utterly charming and an excellent teacher. We learned two types of darning: swiss darning (aka duplicate stitch) and stocking darning. This is the first time I’ve really managed an accurate swiss darn. 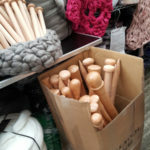 I have a big pile of socks needing mending (most of which belong to DH rather than me) so I will have plenty of opportunity to practise both sorts. Despite the snow, the buses ran fine and (helped by my new favourite app) I was able to duck out of the class and jump straight onto a bus. I made it back to Waverley in time for lunch before my train home. At Durham a young woman got on the train carrying a kitten and sat at my table. The kitten was maybe 3 months old and not in a basket. It behaved impeccably, spending some time on the shoulders of its owner and some looking out of the window. Adorable: no cat I’ve ever had could have been trusted not to cause chaos on a train. The new book on cables from Jen Arnall-Culliford, along with some Socks Yeah DK and a project bag to go with it. 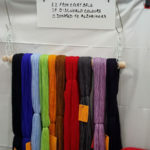 If I get the chance I’ll definitely go again to EYF, although hopefully I’ll be able to persuade someone to go with me. 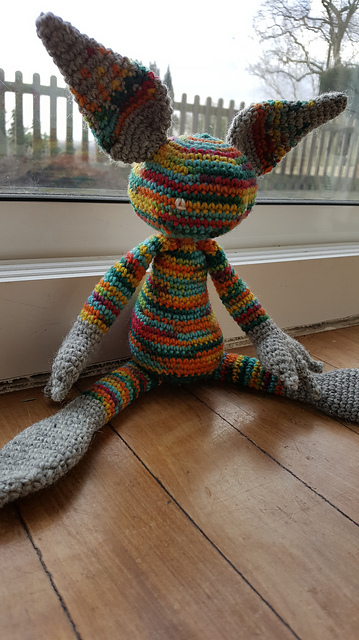 The year began much as it ended with crochet Imaginarium creatures flying off the hooks. After six of these creatures in a year, I’m done for now. There are still three small girls I could make these for, but I need a break. 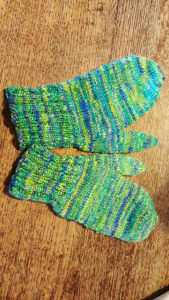 The next project was inspired by a book I got for Christmas: Knit Mitts by Kate Atherley. We had some snow before Christmas and the daughter’s hands got extremely cold as all her mittens and gloves are shop-bought and made of synthetic fibres. Time for some proper wool mittens. I’ve had to guess how much her hands will grow before next winter – they’d better last that long. We’ve already had a couple of incidents of misplaced mittens, but I’m being vigilant and they have so far been recovered safely. 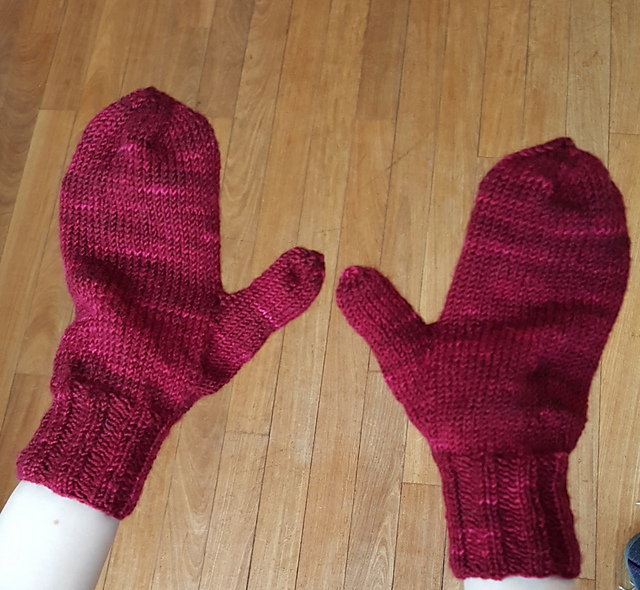 Through an accident of timing, I realised that the mittens were actually eligible for a WIP medal in the Ravellenics. I had been trying to finish them beforehand, but over-ran by a day or so. 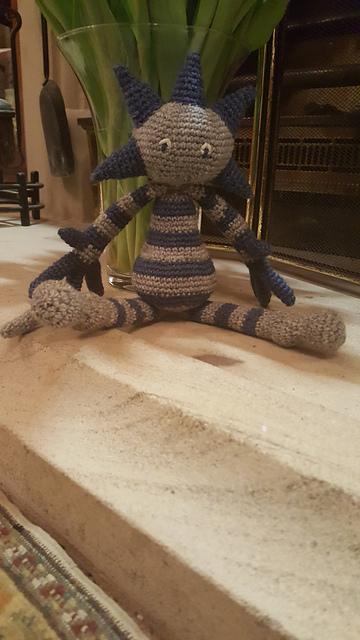 This meant that my main Ravellenics project was started a little late. I’ve had Catkin on my list of projects to make for ages. 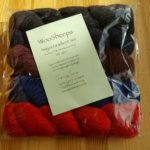 I’ve even had the yarn picked out for a couple of years and kept safely in a bag, but never got round to starting it. 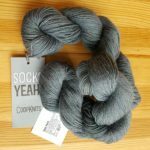 In terms of yarn, it’s basically 2 pairs of socks. 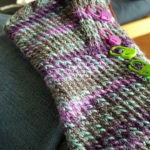 It’s got a few cables, some slipped-stitch colourwork and some simple patterning in knit and purl. I thought this would be a suitably challenging project. 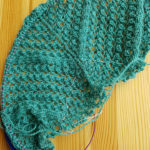 As it’s a shawl that starts with very few stitches and grows every row, measuring progress is a little bit deceptive. Towards the end of the Olympics, my diary was quite busy. There was only one thing for it: I needed a spreadsheet. I can tell you that there are 41270 stitches in a Catkin. 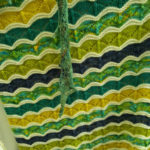 In order to finish it within the deadline, I had a daily target of just over 2500 stitches. It was so satisfying to get to the end of the day and know exactly how much progress I had made and how far ahead I was. 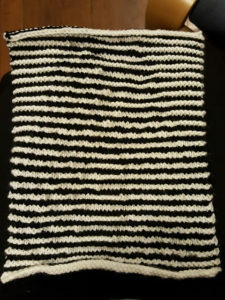 I still don’t have good pictures, but here it is before and during blocking. 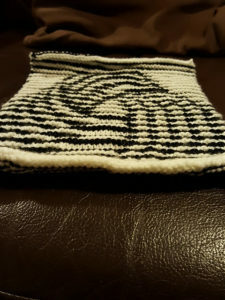 Thanks to the forbearance of some work colleagues who were happy for me to knit through a whole day meeting, I was finished with a couple of days to spare, winning a medal for Shawl Skating and laurels for Stash, Colourwork and Cables. 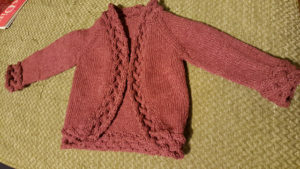 The pattern includes buttonholes. I didn’t put the buttons on initially and quite liked wearing it wrapped several times around my neck. Once the buttons were added, it became a very useful layer to wear under a coat, particularly while cycling. 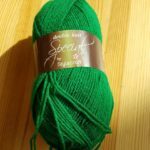 I’ve joined Ysolda’s 2018 shawl club, so I have the first shawl for that on the needles. 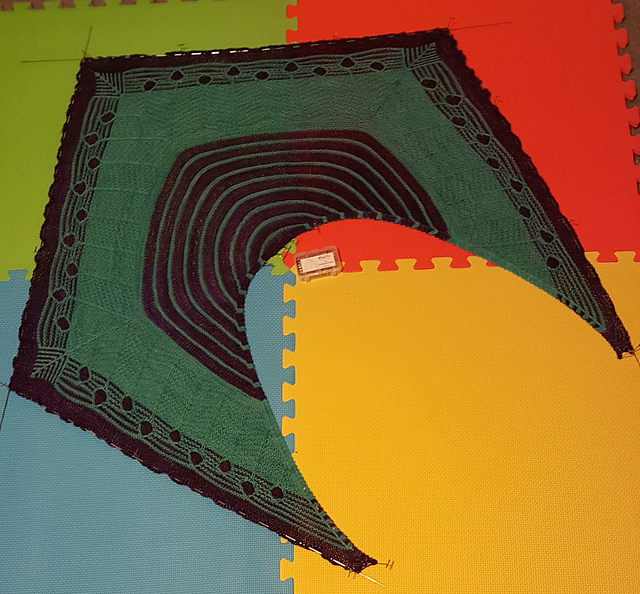 I also got a one-off shawl kit from The Knitting Goddess, because the design was inspired by the daffodils on the hill in the village I live in. This is my main focus at the moment as I’m hoping to put it in an exhibition in a couple of weeks. Since the start of the year, the Fringe and Friends Log-a-long has been appearing all over my social media feeds. 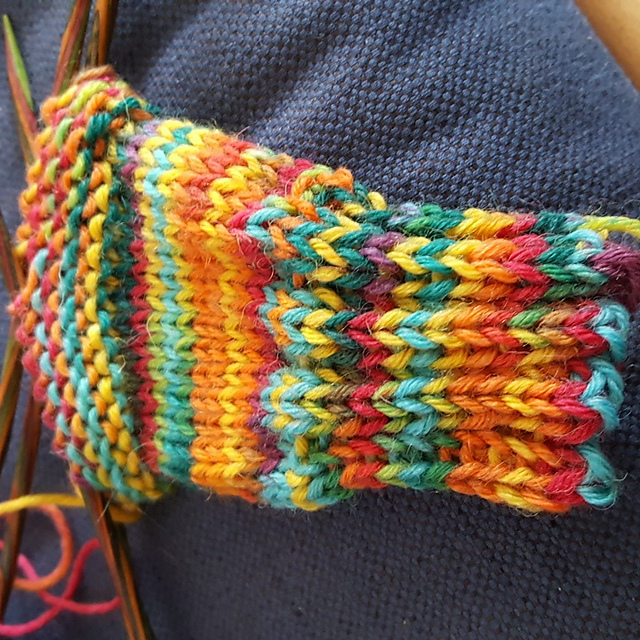 I’ve got a design for a sock half worked-out, made of three log-cabin squares, which are then grafted together. So far, I’ve only made one of the squares. Last autumn’s Toph hat used less than half the yarn, so I have another on the needles for one of my nieces. 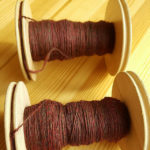 Did I ever mention the three skeins of laceweight cashmere yarn I got in a sale from The Knitting Goddess ages ago? They were used to begin a Color Affection, but frogged due to the muddiness of the colours together. I think it will work with the colour in larger blocks, so I’ve started a Brightstairs. It’s going very slowly. Two pairs of socks: one from Tour de Sock last year, the other one using up some Socks that Rock Mediumweight and a Cat Bordhi pattern. Both pairs are more than half done and just need to cycle to the top of a bag every so often in order to be completed. 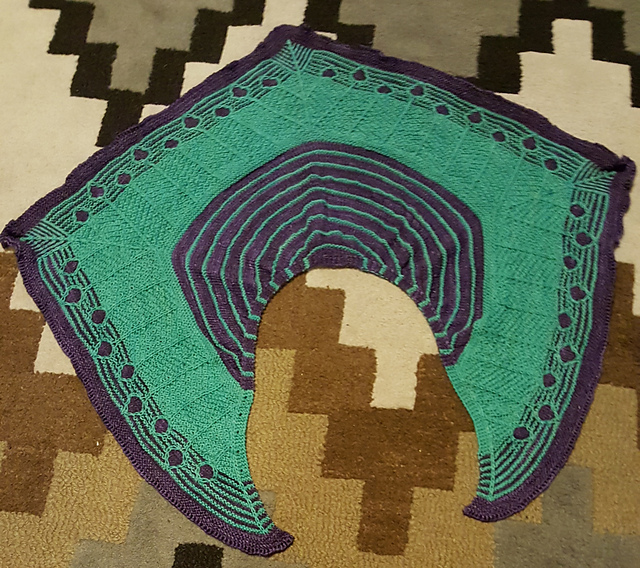 The usual old-faithful WIPS: 2011 KAL blanket and the Plankton crochet kit. I also have half a sheep in carded fibre stashed around my working space. 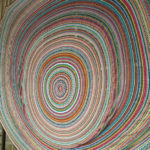 Struggling to spin the batt I started with – not sure I scoured it enough to get the grease out. Last summer, we had a family trip to Herefordshire. We stayed in a yurt on a farm, did various trips out and had a really good week. The daughter spent the whole time bugging the farmer to let her help clean out the animal pens, while the son spent most of the time reading. 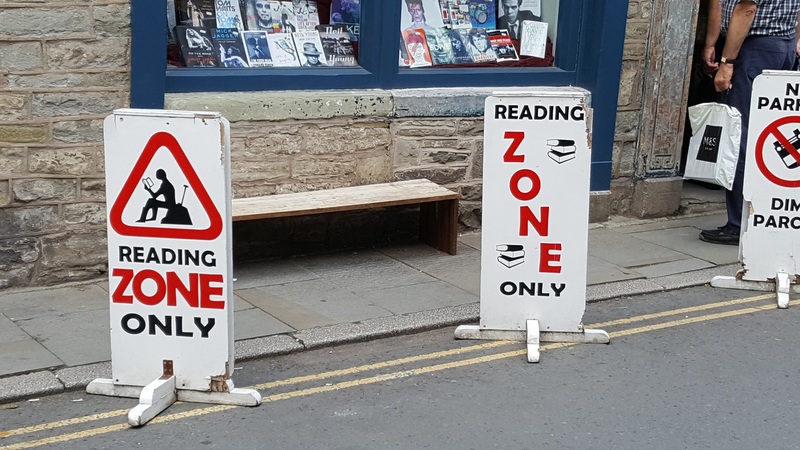 With that in mind, it was clearly time for a trip to Hay-on-Wye, the town of books. DH is familiar with Hay-on-Wye, having accompanied me there on several previous occasions. He’s quietly resigned to not seeing much of me for the day and taking himself off to cafes at appropriate intervals. The question was, how would the kids react? Were they really old enough to appreciate Hay? The daughter, aged 5 at the time, was not really into the whole second-hand book thing. She was intrigued in the first couple of shops, then spent the rest of the day saying things like “not another bookshop”. The son, on the other hand, seemed to be delighted by the whole experience. He came away with quite a pile of books and would, I think, have happily carried on with the browsing and buying for a few more days, particularly as I gave him extra book-buying money. 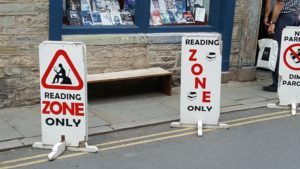 It had been about ten years since I last went to Hay. My impression is that the town has become a little more commercial. The shabby bookshops are not so shabby, everything seems a lot more organised and there’s more crossover between old and new books in the shops. 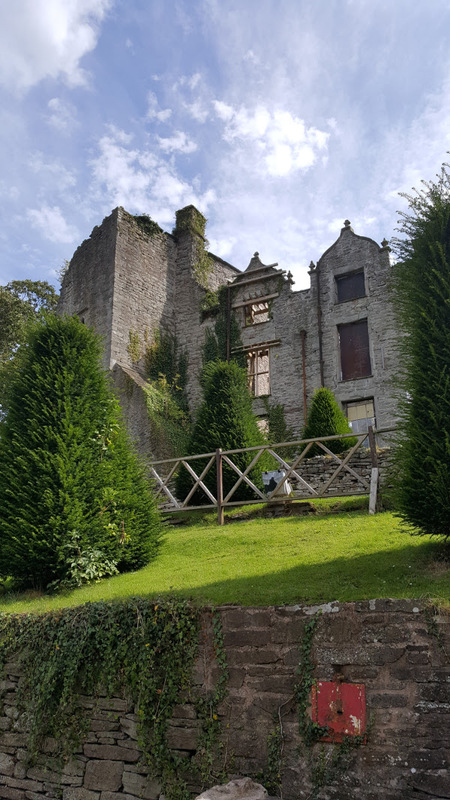 It will be interesting to see what happens with the castle once the crowd-funded refurbishment has been completed. Some things haven’t changed. The honesty bookshop is still there, still without any books I have any inclination to read. 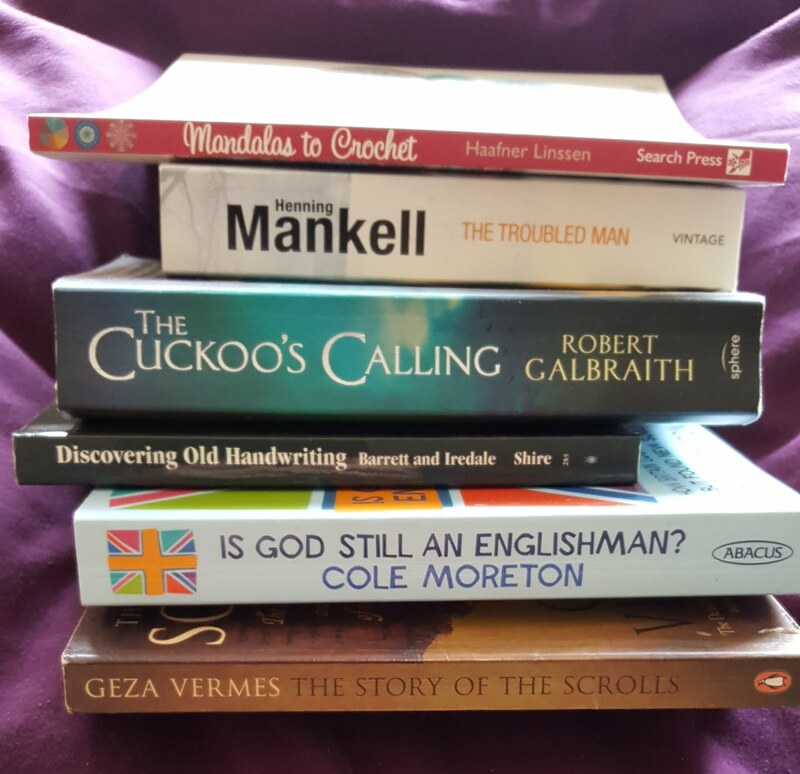 The books I ended up getting have all been sitting on my desk for six months, waiting for me to get round to writing this post. Of course, I’m now writing this upstairs so I need to go and fetch them. Hay did not seem to have a good selection of craft books. I was disappointed not to find more knitting books. I was prepared to wade through vast quantities of vile eighties intarsia sweater books to find some gems. I wasn’t really prepared to find almost nothing. The only one I found that was worth getting was Mandalas to Crochet by Haafner Linssen. I haven’t made anything from it yet, but I do like the idea of crocheted circles so I probably will at some point. The diagrams are particularly clear and the maths is quite intriguing. I tend to pick up Henning Mankell books when I find them cheap. Scandi Noir, without being too noir. The Robert Galbraith is another one on my list of detective novels to try: Galbraith, of course, being an alias of Rowling. Discovering Old Handwriting is one of those books that leapt off the shelf at me. It could come in handy for work if I’m ever looking at old archives, but I really bought it as it adds to my general interest in handwriting. Rounding off the selection are a couple of theological books, neither of which I’ve done more than glance at since buying them. I was particularly happy to discover a stationery shop in Hay, called Bartrums. Here’s the haul from this shop. I’ve read so much about the Palomino Blackwing pencil. Online, it only seems to be sold in packs of 24, which is quite an investment to make for something that might not be to my taste. I was able to buy a single pencil, which has now been in circulation for a while. It’s a good pencil, very smooth both to touch and write with. Is it worth the price-tag? I’m still not sure. I’ll probably stay with my trusty yellow and black Staedtlers with the red end, which I’ve been using as long as I’ve been writing. I’ve taken to picking up washi tape when I find it. It always comes in handy. 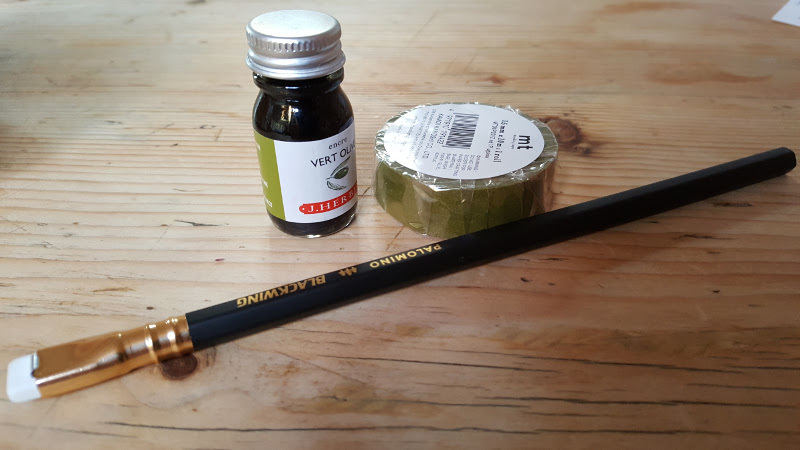 It seems I had a bit of an olive green thing going on that day, as I came back with olive green washi tape and Vert Olive ink from J Herbin. My Lamy Safari is currently using the ink. Now I have got used to the colour being lighter than I expected, I like it. This might be what I’ve been looking for to make beautiful decreases. 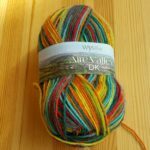 Yarndale is usually the highlight of my knitting year: all my favourite websites and blogs come to life. All the yarns I know only by name can be felt as well as seen. Yarndale this year was excellent (apart from the queueing – despite having advance tickets, we queued for nearly an hour). Once inside, it was a feast for the senses. So much colour, a few fibre animals enjoying the attentions of passers by, and much spotting of amazing creations. 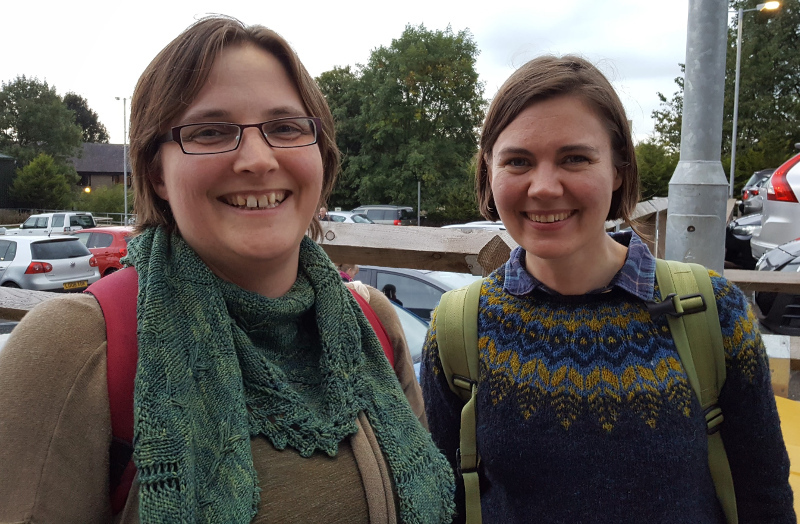 People seemed to have thought as I did – going to a yarn festival means wearing the yarny creation you are most proud of (I wore my Knit your Arrow 2 shawl) . My friend and I spent much of the day shamelessly commenting on the scarves and shawls and jumpers that were on display, like a constant fashion show. Each tea break meant sitting where we could see people queuing and playing guess the pattern. This year was the first time I kept within budget – only spending what I had in my wallet – although I only managed this because I discovered I had more cash in my wallet than I had at first thought. Here’s the haul. Quite restrained. There’s some beautiful neutral linen, plus a whole set of linen mini-skeins. 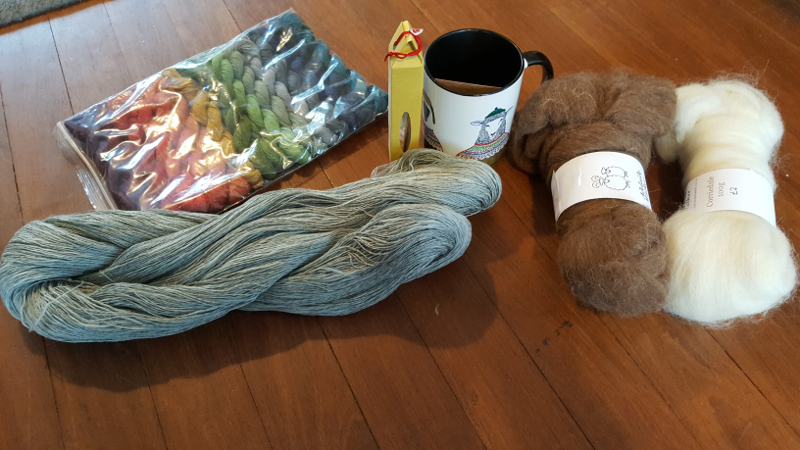 Corriedale and Manx Loughtan fibre, some new tapestry needles in the most beautiful packaging ever and a Scheepes mug. Another purchase went straight to DH to be wrapped up for Christmas, so that will have to remain untold for now. 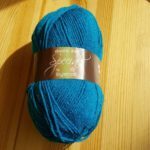 I’m quite excited to have linen to knit with. The Mason-Dixon knitting books have patterns for linen, but I’ve never found any linen yarn before. I’m hoping it will be a summer top of some sort. By far the most exciting thing happened on the way back to the car. We had heard rumours that Ysolda was at Yarndale and we found ourselves walking just behind her. As my friend was wearing a shawl made out of one of her kits, she turned round and noticed it. It was really nice to meet her in person and she even gamely agreed to have photos taken. Happy New Year. I’m beginning the year with a major focus on tidying up and organising. The blog (although often neglected as usual) is no exception. New theme (Twenty Seventeen), new header.